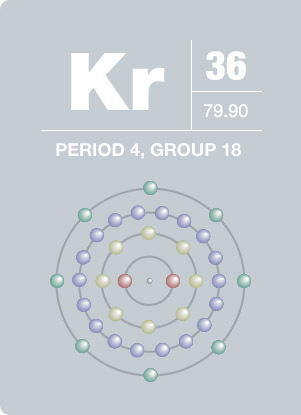 Kr is a gas and is not commonly found in XPS spectra. Kr may be observed as implanted atoms, if a material has been subjected to Kr ion bombardment using Kr gas instead of the more usual Ar gas. Krypton, named after the Greek word kryptos, meaning “hidden”, was discovered in 1898. The element was found in residue of the evaporated components of liquid air by W. Ramsay and M. Travers. The vibrant green and orange spectral- signatured element is considered a noble gas due to its low chemical reactivity. The element’s gas concentration in earth’s atmosphere is about 1 ppm and is isolated by fractioning liquid air. Krypton is most often combined with other rare gases to make fluorescent lamps. Historically, krypton was widely considered to be chemically inert; however, since the 1960’s, studies have found several compounds of krypton – including krypton diflouride and an oxyacid salt containing krypton.